Designed to give you an overall feel for the free-flying sport of paragliding, we will cover all the basics - from flying equipment and safety - to basic flight theory. We start slowly with low, straight and level hops, then, if conditions and skill acquisition permit, progress steadily to several higher exhilarating flights. Before long, you will get your feet off the ground with multiple short, paragliding flights! Great way to spend half a day! With this full day course, you will have the opportunity to fly with one of our instructors on a mountain Tandem Flight. 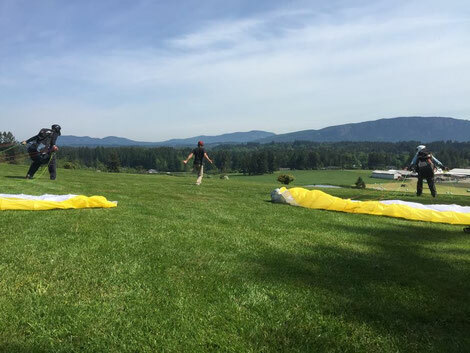 You will also get the chance to try your hand with a solo glider with the goal of getting your feet off the ground (as described above in the SOLO course). You will go home smiling! *Further training is available on a limited, selective basis. We are not in the business of churning pilots out of our school. We do not promise to have you flying solo from a mountain on your first day. If you do end up training with us and working towards your P2 Novice Paragliding rating, you will be trained in such as way as to build skills from the ground-up with lots of practical experience from varied sites. We try to be flexible to accommodate your schedule as well as the weather's. Those who achieve their P2 rating with us are more than qualified to fly sites within BC and abroad and will be confident to make safe and intelligent flying-related decisions. All of your flying dreams! The Solo course is typically 4 hrs, while the DayTaster (as the name suggests) takes the better part of the day. Details will be provided ahead of time. What is the landing part like? If you have ever seen a skydiver land with a high-performance canopy, you will have seen how they swoop down near the ground and 'flare' the canopy just as their feet touch down. Paragliders land in a somewhat similar manner - however, due to their much slower ground speed and much lower descent rate, they provide a much softer landing. Do you just jump off a hill/mountain? No. Paragliders are launched from specific flying sites and, with the guidance provided by your instructor, you take some running strides and are gently lifted off the ground as the glider begins to fly. Why do I have to take a "lesson" - can't I just go for a ride? Unlike in Europe, where every mountain resort offers "Taxi-Flights" as pure joy rides, in Canada, the federal aviation body (Transport Canada) allows tandem flights exclusively for instructional purposes. Not to worry, you will still get to enjoy the pleasure of free flight but you will end up learning a thing or two in the process! (e.g. the basics of what makes a paraglider fly, how it is controlled, launched and landed, etc.). I am afraid of heights! Can I still do it? Believe it or not, but many pilots (paraglider, hang glider, fixed wing, etc.) are actually afraid of heights. There is a significant difference between standing on the ground on a high, exposed place like a tower or a bridge and being completely disconnected from that ground, flying in an aircraft of some kind. The sensation requires relative depth - so if you have nothing to compare the height to, the sensation isn't possible. You'll have to try it to believe it!